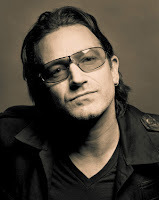 The Secret Diary of Steve Jobs : Bono, you are dead to me. And by the way, stop poaching my engineers. Bono, you are dead to me. And by the way, stop poaching my engineers. You’ve probably heard by now that my ex-friend Bono appeared in the video for the Beastmaster’s farewell keynote last night at CES. Sure, there were other losers involved. Jon Stewart. Slash. Spielberg. Obama and Hillary. But those aren’t people I’ve ever been friends with. So a lot of folks have been emailing me asking if I feel betrayed by Bono. Truth is, Bono and I had a falling out quite a while ago. Started when I threw Fred Anderson under a bus on the options backdating thing, and then got worse when Palm, which Bono part owns, hired Jon Rubinstein, our former iPod and iPhone guru. And it’s been getting worse since. Like, the week before Christmas the SOBs at Palm hired another of our big guns from engineering, a guy named Mike Bell, who’s been with us for 15 or 16 years and has worked on all sorts of products. Now he’s going to run product development at Palm. We’re kicking and screaming and threatening legal action. Legally we can’t do anything — California doesn’t allow non-compete clauses — but we can still make their lives miserable by suing them and tying them up in court and seeking injunctions. And we might do it. I’m not kidding. I mean you know that we’re not a litigious company, we’re all about peace and love and thinking different, and all we really care about is making the world a better place by creating products that people like Gandhi might use. But I swear to friggin God if Palm doesn’t stop poaching our guys I’m going to go over there and burn the friggin place down to the ground myself.